High-definition, or digital lenses, have been described as the most important improvement in prescription eyewear in the last 100 years. The improvement wearers see in moving from traditional lenses to digital lenses has been compared to the difference between a tube television and a new high-definition television, or an off the rack suit compared to a custom suit. If you are dissatisfied with the clarity of your eyesight with your current traditional glasses, fully custom digital free-form eyeglass lenses can provide you with clearer vision in every gaze direction and in all lighting conditions. 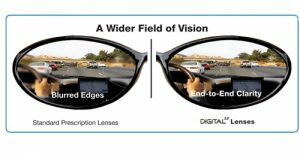 Digital lenses are available in single-vision, high-index and progressive (no-line bi-focal) lenses, so virtually anyone who wears eyeglasses is a good candidate for digital eyeglass lenses. The lenses are available in thin and light materials, making them ideal for long wear, even with the strongest prescriptions. If you wear contacts more than your glasses, but are looking to change it up a little, this lens is also perfect for you! The precision of digital lenses will make your prescription look exactly as it did in the exam room and while you are wearing your contact lenses. the lenses position in front of the wearer’s eyes in the eyeglass frame to provide the most accurate lens power. the angle between the eye and the back surface of the lens in different gaze positions (for example, when the wearer is looking off to the side rather than straight through the center of the lens). the position of the wearer’s pupil within the frame outline. The result is that high-definition lenses provide the widest fields of view, sharper image quality, better peripheral vision, and improve your ability to distinguish subtle differences in light versus dark. Traditional progressive lenses are produced using “pre-molded” templates and the same design is used for every wearer. Digital progressives are customized for each wearer’s prescription. This customization eliminates more distortion and will help you transition to and from far and near vision much more easily. Digital lenses are available in tints, with treatments like anti-reflective coating and in adaptive lenses that adjust from clear indoors to dark outdoors, to provide the most natural vision for your active lifestyle.